Unless you’ve been on the planet Mars or in Dodds Prison for the last few days, you know that a BP oil rig off the coast of Louisiana, USA exploded, caught fire and is spewing 5000 barrels of oil a day into the already-not-pristine waters of the Caribbean. 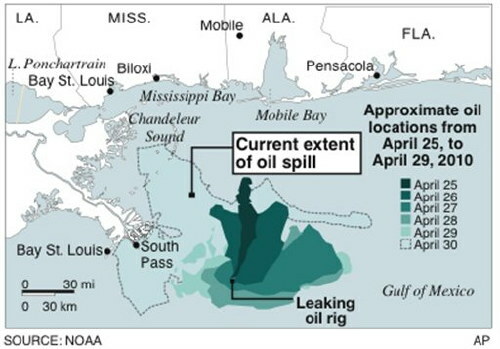 An oil slick the size of the state of West Virginia is starting to come ashore and threatens all along the southern USA coast from Louisiana, Mississippi, Alabama to Florida. The Mississippi River is covered with oil a mile up from the coast and that’s just the start. This is the end of the world for many coastal communities because as we saw with the Exxon Valdez in Alaska and the Shell Oil spill in Barbados these disasters kill everything for decades. President Obama has declared a national emergency and sent in the military to do what they can do, but the magnitude of the spill means that only God could now prevent the total destruction of fisheries and tourism on thousands of miles of coastline. “BP suggested in a 2009 exploration plan and environmental impact analysis for the well that an accident leading to a giant crude oil spill — and serious damage to beaches, fish and mammals — was unlikely, or virtually impossible. Some news stories indicate that the oil rig in question had major problems and safety violations for some time prior to the disaster. Some stories say that the oil rig was an older technology and that the operators were reckless. Some say that the rig met standards (whatever they are) but that nothing at sea is guaranteed 100% safe and secure. Only the last statement about nothing at sea being 100% safe and secure is obviously true, but none of that matters to the poor folks along the coast who are seeing their lives destroyed. We know from past experience that any lawsuits will take two decades or more to settle. We know from past experience that committee after committee will perform study after study while tens of thousands lose their homes, jobs and businesses. Families will disperse. Lifetimes, even generations, of toil and sacrifice will be destroyed. But BP British Petroleum will do alright because no doubt the rig was owned and operated by sub-companies with limited assets and even thinner insurance coverage and liability. BP will do alright because the politicians of the United States of America put the long term interests of the ordinary people and the nation secondary to the great god of MONEY and PROFIT. All of which leads us to former Barbados Minister of Energy and the Environment Elizabeth Thompson. During her tenure as Environment Minister, Elizabeth Thompson took the lead in auctioning off oil exploration areas around Barbados to multi-national oil companies. The Bajan news media proclaimed exaggerated benefits and mentioned no downside to this sell-a-thon of Bajan sovereignty. Unnoticed and unmentioned by Liz Thompson and the Bajan news media though, was the fact that Barbados has no environmental legislation, regulations or enforcement organisation to police the oil companies. This disaster that will do so much damage along the US coast could easily have happened to our beaches. Imagine the slaughter of our economy if this happened to Barbados! The days of “let the oil companies do what they want” should be long gone, but as we’ve seen with the Shell Oil pipeline spill along our south coast, our politicians for some reason seem to favour the polluting oil companies over our country’s future. The oil spill disaster along the southern US coast should be a wake-up call to Bajan citizens. Hear the message well, my friends: our politicians are putting their own interests first over Barbados, and they can do so much damage if we allow them to act without the oversight of average citizens who are concerned for our children’s futures. Since we first published this article over five months ago, World Net Daily has continued to mislead its readers and “Tea Party at Sea” attendees as to the true destination of the cruise. The word “Haiti” is still not mentioned in the WND.com adverts about the cruise – despite this article and our email to Joseph Farah of World Net Daily back in April. In our email (below) we asked Mr. Farah to tell his Tea Party folks the truth so they might be moved to help the Haitian people. Nope, Mr. Farah kept silent. Poor show, Mr. Farah. Frankly, we expected much better from you and WND.com. And… the Wall Street Journal read our article and then published their take on the story on September 15, 2010 without mentioning BFP or our plea for WND to assist the Haitian people. Poor show, Wall Street Journal. We know you visited Barbados Free Press during your research several days before you published your article. Mr. Farah and World Net Daily responded to the Wall Street Journal article but not to ours or our email. Ho hum. At least CNN, USA Today and many other news organisations have mentioned Barbados Free Press when they use our material or ideas. Will World Net Daily WND.com tell the truth about cruise destination and Royal Caribbean’s exploitation of Haitians? The right-wing conservative website World Net Daily (wnd.com) is holding a “Tea Party at Sea” cruise this September that features a host of anti-Obama speakers and seminars. World Net Daily supporters, editor Joseph Farah and other “birthers” are engaged in an ongoing campaign to discredit President Barack Obama and his political and social agenda. One of their tactics is their claim that the man Americans elected to the White House in November 2008 does not meet the US Constitutional qualifications to be President. Well, okay – if people want to waste so much time, energy and money pursuing that doomed-to-fail agenda, that is their right. God knows one of the things we really admire about the USA is the protection of freedom of speech – which is quite contrary to the situation in Barbados where the truth is no defense against the defamation lawsuits, threats and job loss that Bajans often suffer if they are effective in criticizing the political and business elites. The recent stories about Haiti’s political troubles and the UN being fingered for causing the recent outbreak of cholera bring us back to this story about the the UN’s refusal to use Caribbean engineers after the January 2010 earthquake. We haven’t seen much progress in Haiti since the earthquake – with millions still camped in the open. We wonder about all the aid pledges and foreign assistance on the ground. Have things returned to “normal” with the rest of the Caribbean and the world content with the state of affairs? If Haiti wasn’t an island but was instead a part of Florida, would the response be the same? What was the UN’s agenda in ignoring Caribbean Professionals? The day after the devastating earthquake in Haiti, Bajan professional engineer Grenville Phillips II started organising Caribbean structural engineers for deployment to Haiti to assist in evaluating the thousands of damaged schools, hospitals and other public buildings and to train Haitian engineers to perform the same task. “But don’t expect the Barbadians to find fault. Three years ago, Barbados Maritime Ship Registry (BMSR) issued new guidelines for investigators of marine accidents. As the BMSR announced, the guidelines were introduced “to ensure that general marine investigations conducted on behalf of a flag state are focused on understanding the cause of an incident rather than simply apportioning blame. BMSR Principal Registrar Chris Sawyer believes that the culture of blame has become too prevalent in marine casualty investigations. …the Transportation Safety Board of Canada decided to conduct a parallel investigation into this accident independently of the Barbadian investigation. The TSB made the decision to investigate because the scope and methodology used to uncover causes and contributing factors will likely be different than that of the Barbados authority. Meanwhile, in accordance with the provisions of international conventions, the TSB remains committed to providing assistance to the Barbados authority as it proceeds with its investigation. Let’s get one thing straight: the Canadians have a right to investigate whatever they please. After all, the Concordia was based in Canada, owned by a Canadian school and the majority of people on board were Canadians. The Canadians can make any inquiries they wish. But Barbados has a duty in law to investigate the sinking of a Barbados-flagged vessel and our country shall investigate professionally according to our standards. The Canadian authorities were happy enough to allow a Bajan “flag of convenience” on a vessel based in their country, so they might want to be a little careful criticizing Barbados now. Even Canada’s former Prime Minister Paul Martin has his commercial cargo ships headquarters in Barbados! As to standards for the sailing vessel Concordia, she was built for the Canadians in Poland, first registered in the Bahamas and then in Barbados. 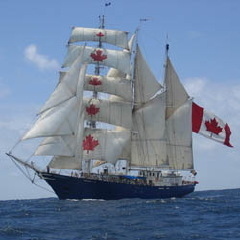 The Canadian authorities inspected her last year to allow the vessel to participate in a tall ship rally in Canada. Online conversations we’ve read at various tallship sailing forums describe the confusion, lapses and conflicts over stability standards for sailing school ships. From what I’ve seen Canada doesn’t even have any construction or stability standards for tall ships so the Canadian authorities should drop their self-righteousness and disdain for Barbados that is inherent in their press release. SANTIAGO, Chile – A massive 8.8-magnitude earthquake struck Chile early Saturday, killing at least 78 people, collapsing buildings and setting off a tsunami. A huge wave reached a populated area in the Robinson Crusoe Islands, 410 miles (660 kilometers) off the Chilean coast, said President Michele Bachelet. “It has been a devastating earthquake,” Interior Minister Edmundo Perez Yoma told reporters. – Captain says “a miracle” that everyone survived. Barbados will be responsible for carrying out an investigation into the rough-weather sinking of the sailing vessel Concordia because the ship was registered in our country. According to Transport Canada spokesman Steve Bone, these are rules even though the ship was based in Lunenburg, Canada and was owned by a Canadian school “Class Afloat”. A total of 64 crew and students took to the lifeboats and were rescued about 500kms off the coast of Brazil. A Brazilian Navy report says the vessel turned upside down in strong winds and that the survivors were picked up after spending almost 24 hours adrift in their lifeboats. I can’t imagine what it would take to perform a proper investigation into the sinking, but presumably our officials would have to interview all crew and many of the students. The vessel was built eighteen years ago in Poland and there have probably been changes since then. Perhaps videos or photos from past cruises would be helpful. The news media says that the vessel had a good reputation for being seaworthy and was seriously inspected last year by Canadian authorities as a requirement to allow the ship to travel between Canadian ports as part of a Tall Ship festival. In 1996 an explosion on board caused the death of a student en route to Australia. There is no indication in the media as to whether Barbados officials investigated that event. I presume that Barbados will be responsible for the entire cost of the current investigation as it just goes with the job if our country is in the business of offering itself as a flag of convenience to offshore vessel owners. Thank the Lord there were no deaths because then we’d really have to pull out all the stops for an investigation and in a worst-case disaster that could be expensive. Now there’s a question: How much does Barbados receive every year for allowing vessels to use our flag? How many vessels and how much money per vessel? What are the expenses to run such a registration system? And what about vessels that default on payment? What does Barbados do then? It seems to me that the answers to those questions would make an interesting story. “I would think generally we are not (prepared) and we need to seriously look at what we are doing and change the way we do business where the built environment is concerned,” President of TTCA, Mikey Joseph said. Past-President of APETT, Mark Francois, told us of estimated multi-billion dollar damage to buildings if a natural disaster were to hit our main cities. “Potential building economic loss … in Port of Spain was of the order of US$5 billion and in San Fernando US$6 billion” Francois said. Francois went on to make 3 other important points – firstly, as a former British colony, our professionals had used British Standards up until the late 1960s, with the risk to us being that, since the British Isles are not prone, those standards did not take account of earthquakes. As a result, he stated that major parts of our civil infrastructure, upon which we would rely in a disaster, were not designed or built to withstand earthquakes. His example of the POS General Hospital being one such structure was sobering. Secondly, he stated that building plans are being certified by engineers who do not posses the necessary qualifications in structural work and that he had done assignments to re-design some of those ‘certified’ plans. Thirdly, he dealt with the well-known practice of engaging personnel employed with the regulatory authorities to draw plans for buildings and obtain permission. This begs the question as to how could a public employee on such a ‘PJ’ fail to pass their own plans. These quotes were drawn from the Trinidad Express story on Friday 5th February. The speaker on this aspect was Dr. Walter Salazar, Senior Research Fellow at the Seismic Research unit at UWI. The three main points from his presentation were firstly, that our country is indeed at similar risk as Haiti in terms of a strong earthquake. Secondly, the most likely areas for the strongest earthquakes are Tobago and the north-west peninsula of Trinidad, particularly Chaguaramus. Thirdly, we are now overdue for that strong earthquake. The head of our Office of Disaster Preparedness and Management (ODPM), Col. George Robinson has confirmed, in light of natural public concerns, that our systems are in place to deal with such an earthquake. Knowing the individual, there is little doubt in my mind that the necessary diligence has been applied to developing solid systems. What is the likely financial impact? My concerns as to our level of earthquake-preparedness are rooted elsewhere and that is at the level of the ‘financial safety-net’ upon which we would rely in the event of such a disaster. Our low national savings rates have long been a concern of economists/financial experts. We do not save enough money, in the view of these experts, to propel our country’s journey to the next level of national development. My concern is the implied question of how we would cope with a destructive earthquake. Add to that the fact that only a small fraction of our buildings are properly insured and a worrying element to the disaster-preparedness picture starts to emerge. Aside from the structural concerns and seismic risks as outlined above, there is a question as to the nature and extent of our financial safety-net. Where will we find the money to rebuild? Our lending institutions need effective systems to ensure that the properties they hold as security are properly insured. Such an earthquake would also damage our infrastructure – roads, water and electrical distribution systems, drains and so on. As a consequence, even if your own property is undamaged or properly-insured, you could also suffer from the wider damage. If your entire neighbourhood is severely-damaged, apart from the issue of loss of life and physical injury, there would be a negative effect on the value of your property. I am suggesting that this is an issue which needs our urgent attention and that the private sector can take the lead. The Association of Trinidad & Tobago Insurance Companies (ATTIC) and the Bankers’ Association of Trinidad & Tobago (BATT) can take a leadership position here. One way forward could be for the insurance and banking sectors to agree, in their self-interest, a minimum code for design and construction with APETT and the TTCA. That would be one way to set a benchmark in terms of proper standards for all financed or insured construction going forward. In terms of existing privately-owned building owners, the Central Bank should consider adding a component on the importance of proper insurance to their National Financial Literacy Programme. The other urgent requirement is the retro-fitting of our major public buildings to meet the challenge of these overdue earthquakes. Thank you to APETT and the TTCA for organising this important intervention. Afra Raymond is a Chartered Surveyor, Managing Director of Raymond & Pierre Limited and President of the Institute of Surveyors of Trinidad & Tobago. Feedback can be sent to afra@raymondandpierre.com.